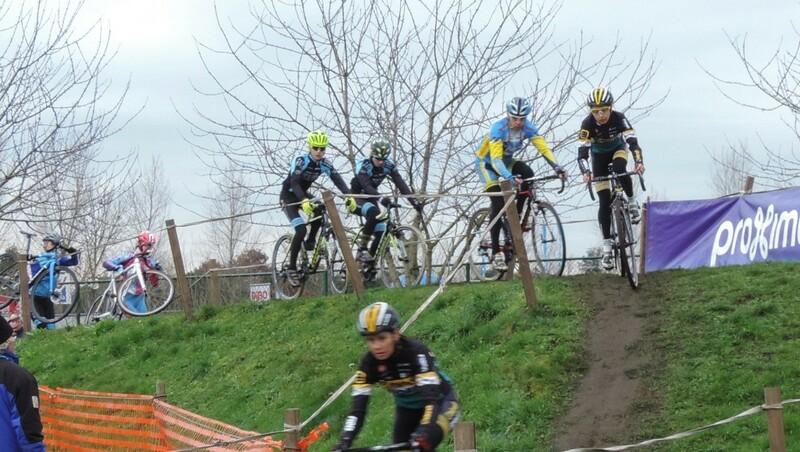 On the fifth day of CXmas the Bpost Bank took us to Loenhout. One of the regular guys couldn’t make it today (apparently, some people have family that want to see them at CXmas!) so with transferred in 2 others, Paul and Jos, to take his place. Getting to Loenhout involved bike, train, car 1 and car 2 to get there. It might have paid me to actually look on the map beforehand, butit’s really not that much of adventure if you know where you’re going. Today was a special day because, for the first time this season, we were going to be living it up in VIP tent. After parking up we made out way to centre of town where we met our benfactor from Primus Haacht beer to collect our tickets. The Guys were all in for an early beer, but I settled for a coffee and a chance for a pee in a flushing toilet. From our vantage point the buses from the elite riders were arriving: the brothers Vanthourenhout first, then the Sven bus. Being absolutely crap at standing around in bars talking tatt (see Robert Rankin) I was itching to get out to see the course, so giving our heartfelt thanks, we gave our leave and headed off to see the Newbies last lap. Some of the women were out already practising the whoop-de-whoops, but the Junior were about to start so I didn’t have long to wait to see it at full race speed. It was at this point that my camera froze! I actually had to hit to turn it off and then again to switch it back on. Oh Joy! This does not bode well! But good news – I found some K-Pau fans to have a chat with. 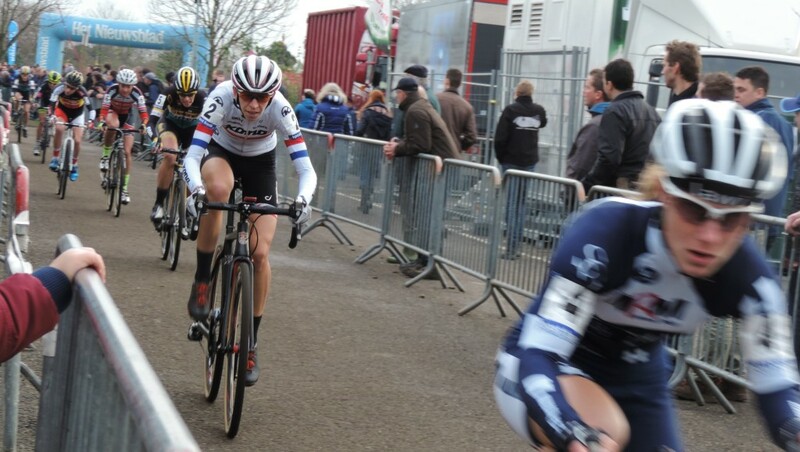 The topic of discussion this week was about MvdP riding disc brakes and cutting inside Kevin in that last lap at Diegem. 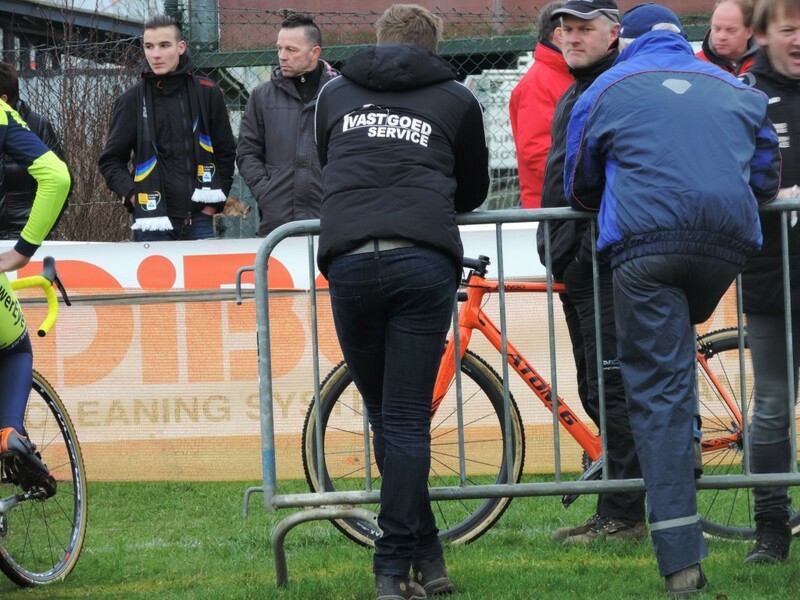 Question – Did you notice that Kevin was riding with disc brakes at Zolder but not at Diegem? Apparently he just simply doesn’t like them, but you can be sure he’ll be practising with them more over the coming weeks. As we made our way to the VIP tent for 12 o’clock it started to get cold and rain just a little so we were super grateful again. You also may be grateful when i tell you that being in the VIP tent does not make for great stories or great photos as they come past way too quickly/ Doesn’t stop me from trying though! The food in the VIP was lovely, although a bit more consideration for vegetarians would be appreciated. We all did our best to eat and drink a sample of everything (like you do). 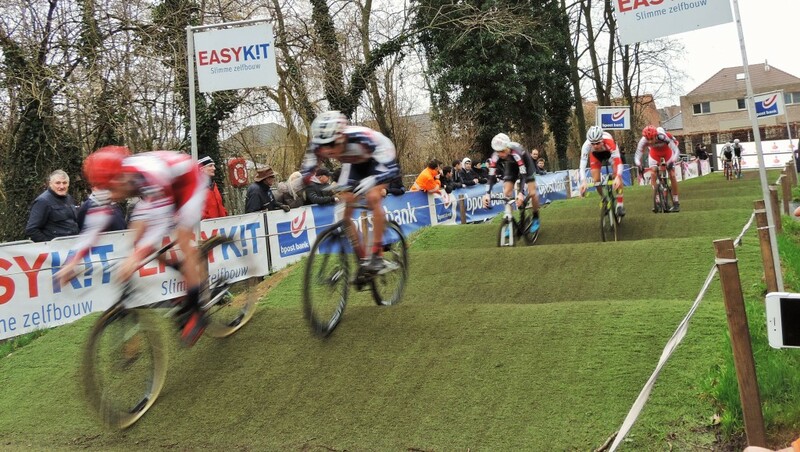 Out on the course Ellen van Loy was having another great ride after her big win in Diegem. Jos is a fully paid up member of the Ellen van Loy supporters club and when he got out his membership card I noticed the Amy D Foundation Logo. It took me a good 10mins of crap Dutch to explain who what and where the 5 mins the later the penny dropped and it was ‘Oh, the American girl’ *face palm! I went out to see the men practising and was as surprised to see Angus Edmond riding as he was to see me outside the VIP! I got another brief Niels sighting and then it was all way too fast! 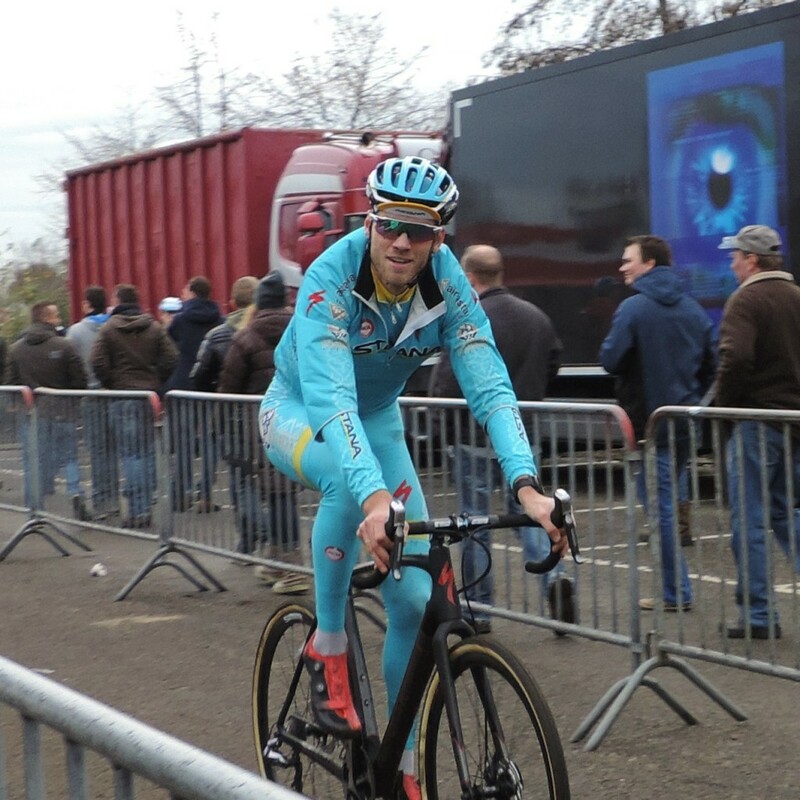 MvdP was riding the Rainbow Camo bike today though and Lars Boom was eyeing my beer. We saw a bit of racing, ate some good food, drank a whole lot of beer and hung out with friends in the warm and dry. Kevin didn’t win, but it was a good day. See you in 2016 at Baal.